This is another video produced by the progressive American news service, The Young Turks, of the Labour conference at Brighton the week before last. The panel was entitled ‘Welcome to the End of the Neoliberalism’. Held in a dingy nightclub, the female host jokes about how her audience can say exactly where they were when neoliberalism ended, and that, as with nearly all revolutions, the women were first and the men came late. With her on the panel were Paul Mason, a former Channel 4 journo, playwright, documentary film maker, and the author of the book ‘Postcapitalism’; Jo Littler, an academic, who specialises in cultures of consumption, and the author of a book on meritocracy, pointing out that this is precisely what it isn’t, as meritocracy is a system that reinforces minority, elite rule; Valary Alzaga, a labour organiser working with the people at neoliberalism’s sharp end in precarity; and Clive Lewis, the MP for Norwich. Paul Mason begins the discussion by trying to describe what neoliberalism is in reality, rather than neoliberalism as a collection of ideas. In doing so he states that he has annoyed the Adam Smith Institute. And he includes not only the perfect, ideal capitalist states of the West, but also mercantilist states like China, as they are now part of the same global system. He states that you could go back to the German ordoliberals to describe it, and to people like Von Hayek and the Chicago School. But he begins with Peugeot’s definition of its aims at a meeting in Paris in 1938. This described precisely what neoliberalism is not: it is not traditional laissez-faire economics. The early neoliberals realised that if markets and market forces were left on their own, the result would be monopolies that would be nationalised by the state, according to Marxist doctrine and praxis. So they sought to enforce competition at every level. This means not only privatisation, and the introduction of legislation to force companies to compete, but also the creation of competition as a mindset to keep working people isolated and competing against each other. The result can be seen in the favelas – the deprived slums – of Latin America, where you have poor people living in former factories that have closed down. Then the housing association is dissolved, and the mob moves in, as only through organised crime is there safety. And Mason states very clearly that it isn’t only in Latin America that this process has occurred. It’s also happened in many of the towns in the north of England, where industry has been gutted and forced overseas, and the result has been a massive upsurge in crime. He goes on to state that at first neoliberalism was devised so the rich West could exploit Latin America. But after the Fall of Communism opened up the 20 per cent of the world market that was the former eastern bloc, it became a global system. However, neoliberalism is now collapsing. It produces a series of crises, and so rightwing politicians like Trump, rather than destroying it, are producing nationalist versions of neoliberalism. That is, they are turning away from it as a system of international trade, but still enforcing it in their own countries as a system of private ownership that excludes and exploits the poor. Jo Littler says much the same as Mason in a much briefer speech. She refers to it as ‘disembowelling’ the public, meaning the enforced privatisation of public services. She also describes how two of the sources for neoliberalism were the German Ordoliberals, who turned away from the state-managed economy of the Nazis, and von Hayek and the Chicago school. She also mentions how it was first proposed by the Montpelerin meeting in Paris. And she also makes the point that it took a long time for them to have their ideas accepted, as until the Chicago School, Pinochet and Thatcher they were isolated cranks and weirdoes. Valary Alzaga explains that she is a care worker, who are some of the most poorly paid workers with the most precarious jobs. She describes how, under neoliberal capitalism, care homes have been privatised, bought up by hedge funds and venture capitalists, who have then gone on to sell off whatever was profit-making. As for care workers, neoliberalism means that if they try to form a union, they are immediately sacked. Under socialism and Keynsianism there was a social pact, by which employers and the state recognised the rights of workers to form trade unions and bargain for better pay and conditions. This no longer exists. Clive Lewis, who to my mind looks like a younger version of Noel Clarke, the actor, who played Rose Tyler’s boyfriend in Dr. Who, is an economics graduate. He describes how, when he was studying it, he and the other students were filled with its doctrines, but no-one ever mentioned the word. He only woke up to what it was and really meant when he happened to go on a summer course about it. He describes this in terms of a religious revelation. He says it was as if he’d been deprogrammed. When he returned, his friends complained that it was as if he’d joined a cult, because all he talked about was neoliberalism, neoliberalism and neoliberalism. He states that the goal of von Hayek wasn’t to set up an independent party, as he was asked by one of his followers. He wanted instead to permeate the academic institutions, like the universities and take over the whole system. And so this resulted in Blair and Brown accepting it as absolutely true, and introducing it into the Labour party. He refers to the story, which he thinks was apocryphal, about Thatcher being asked what her greatest achievement was. Instead of pointing to one of her wretched privatisations, she said it was Tony Blair and New Labour. Lewis states that their adoption of neoliberalism is unforgivable with the benefit of 20/20 hindsight but you have to understand the state of British politics at the time. This is a fascinating analysis of the rise and destructive effects of neoliberalism. Robin Ramsay, the editor of ‘Lobster’, also studied economics in the late ’60s – early ’70s, and he states that Thatcher’s beloved Monetarism was considered so much rubbish that his lecturers didn’t even bother arguing against it. And before Thatcherism turned to mass privatisation and the idolatrous adulation of the free market after 1981-2, neoliberalism was considered very much an extreme doctrine held only by cranks. Which is what it should return to being. As for annoying the Adam Smith Institute, they have been pushing for the complete privatisation of all state assets, including the NHS since the 1970s, so annoying them is, in my view, a good and holy occupation. And in amongst their dissection of neoliberalism they also have a gibe at Jacob Rees-Mogg, which is also always a good thing. I picked this up in one of the secondhand bookshops in Cheltenham. I am definitely not a Liberal, but so many of the foundations of modern representative democracy, and liberal political institutions, rights and freedoms were laid down by Liberals from the 17th century Whigs onward, that this book is of immense value for the historic light it sheds on the origins of modern political thought. It is also acutely relevant, for many of the issues the great liberal philosophers, thinkers and ideologues argued over, debated and discussed in the pieces collected in it are still being fought over today. These are issues like the freedom, religious liberty and equality, democracy, anti-militarism and opposition to the armaments industry, imperialism versus anti-imperialism, devolution and home rule, laissez-faire and state intervention, and the amelioration of poverty. Alan Bullock is an historian best known for his biography of Hitler: A Study in Tyranny, which remains the classic work on the Nazi dictator. In the 1990s he produced another book which compared Hitler’s life to that of his contemporary Soviet dictator and ultimate nemesis, Hitler and Stalin: Parallel Lives. 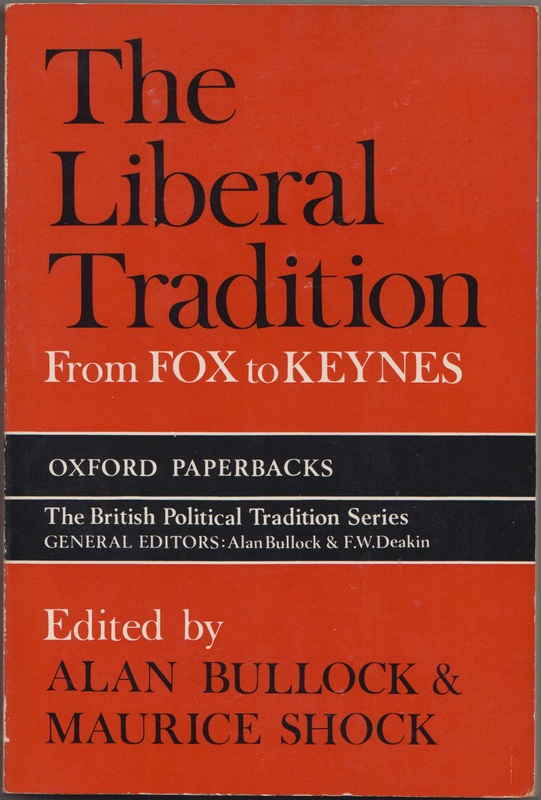 The book has an introduction, tracing the development of Liberalism from its origins to the 1930s, when the authors consider that the Liberal party ceased to be an effective force in British politics. 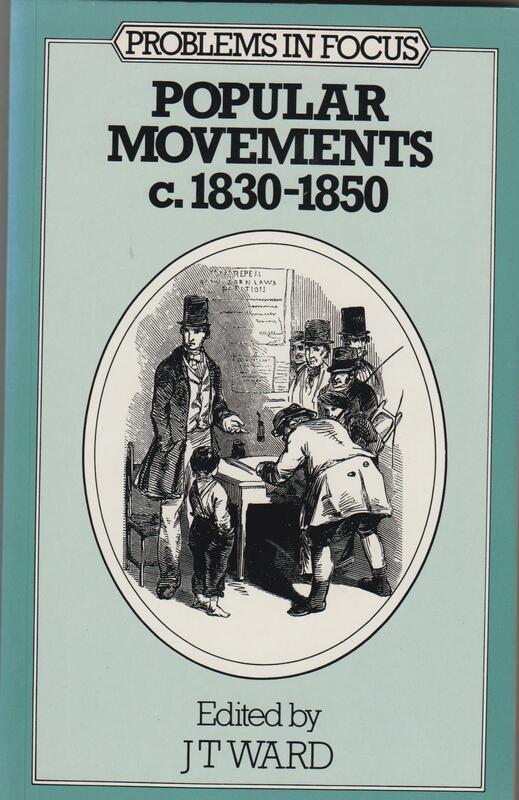 This discusses the major issues and events, with which Whig and Liberal politicians and thinkers were forced to grapple, and which in turn shaped the party and its evolving intellectual tradition. Parliamentary speech by R.B. Sheridan, 1810. Parliamentary speech by Earl Grey, 1819. Lord John Russell, An Essay on the History of the English Government and Constitution, 1821. Lord John Russell, parliamentary speech, 1828. Speeches by Charles James Fox, from 1793, 1794 and 1800. Marquis of Lansdowne, parliamentary speech, 1821. Extracts from Byron’s poems Sonnet on Chillon, 1816, Childe Harold, Canto IV, 1817, and Marino Faliero, 1821. Lord John Russell, parliamentary speech, 1822. Lord Melbourne, parliamentary speech, 1831. T.B. Macaulay, parliamentary speech, 1831. Part II. The Benthamites and the Political Economists, 1776-1830. Two extracts from Adam Smith’s The Wealth of Nations, 1776. Jeremy Bentham, A Manual of Political Economy, 1798. T.R. Malthus, Essay on Population, 1798. David Ricardo, The Principles of Political Economy and Taxation, 1819. Petition of the London Merchants, 1820. Jeremy Bentham, Plan of Parliamentary Reform, 1817. David Ricardo, Observations on Parliamentary Reform, 1824. Jeremy Bentham, Constitutional Code, 1830. Part III. The Age of Cobden and Bright. Petition of the Manchester Chamber of Commerce to the House of Commons, 20 December 1838. Richard Cobden, two speeches in London, 1844. Lord John Russell, Letter to the Electors of the City of London (The ‘Edinburgh Letter’) 1845. Richard Cobden, parliamentary speech, 1846. T.B. Macaulay, parliamentary speech, 1846. Joseph Hume, parliamentary speech, 1847. T.B. Macaulay, parliamentary speech 1847. John Bright, parliamentary speech 1847. T.B. Macaulay, parliamentary speech, 1833. John Bright, two parliamentary speeches, 1851 and 1853. Richard Cobden, speech at Rochdale, 1863. Lord Acton, The History of Freedom in Antiquity, 1877. Lord Acton, A Review of Sir Erskine May’s ‘Democracy in Europe’, 1878. Lord Acton, letter to Bishop Creighton, 1887. John Morley, On Compromise, 1874. W.E. Gladstone, two parliamentary speeches, 1877 and 1878; speech at Dalkeith, 1879; speech at Penicuik, 1880, speech at Loanhead, 1880; article in The Nineteenth Century, 1878. John Bright, speech at Dublin, 1866 and parliamentary speech, 1868. W.E. Gladstone, two parliamentary speeches, 1886 and 1888. H.H. Asquith, speech at the Albert Hall, 1909. Sir H. Campbell-Bannerman, speech at Stirling, 1901. Sir J. Brunner, speech at the 35th Annual Meeting of the National Liberal Federation, 1913. Sir William Beveridge, Full Employment in a Free Society, 1944. The Liberal Way, A survey of Liberal policy, published by the National Liberal Federation, 1934. J.M. Keynes, Am I a Liberal? Address to the Liberal summer school at Cambridge, 1925. In their conclusion, Bullock and Shock state that Liberal ideology is incoherent – a jumble – unless seen as an historical development, and that the Liberal party itself lasted only about seventy years from the time Gladstone joined Palmerstone’s government in 1859 to 1931, after which it was represented only by a handful of members in parliament. The Liberal tradition, by contrast, has been taken over by all political parties, is embodied in the Constitution, and has profoundly affected education – especially in the universities, the law, and the philosophy of government in the civil service. It has also inspired the transformation of the Empire into the Commonwealth. It has also profoundly affected the British character at the instinctive level, which has been given expression in the notion of ‘fair play’. In the pages which follow two ideas recur again and again. The first is a belief in the value of freedom, freedom of the individual, freedom of minorities, freedom of peoples. The scope of freedom has required continual and sometimes drastic re-defining, as in the abandonment of laissez-faire or in the extension of self-government to the peoples of Asia and Africa. But each re-definition has represented a deepening and strengthening, not an attenuation, of the original faith in freedom. The second is the belief that principle ought to count far more than power or expediency, that moral issues cannot be excluded from politics. Liberal attempts to translate moral principles into political action have rarely been successful and neglect of the factor of power is one of the most obvious criticisms of Liberal thinking about politics, especially international relations. But neglect of the factor of conscience, which is a much more likely error, is equally disastrous in the long run. The historical role of Liberalism in British history has been to prevent this, and again and again to modify policies and the exercise of power by protests in the name of conscience. (p. liv). We end it by pointing to the belief in freedom and the belief in conscience as the twin foundations of Liberal philosophy and the element of continuity in its historical development. Politics can never be conducted by the light of these two principles alone, but without them human society is reduced to servitude and the naked rule of force. This is the truth which the Liberal tradition has maintained from Fox to Keynes – and which still needs to be maintained in our own time. (pp. liv-lv). It should be said that the participation of the Lib Dems was all too clearly a rejection of any enlightened concern for principle and conscience, as this was jettisoned by Clegg in order to join a highly illiberal parliament, which passed, and is still passing under its Conservative successor, Theresa May, legislation which is deliberately aimed at destroying the lives and livelihood of the very poorest in society – the working class, the disabled and the unemployed, and destroying the very foundations of British constitutional freedom in the creation of a network of universal surveillance and secret courts. These alone are what makes the book’s contents so relevant, if only to remind us of the intense relevance of the very institutions that are under attack from today’s vile and corrupt Tory party. 1. The Agitation for Parliamentary Reform, discussing the campaign for the 1833 Great Reform Act, which expanded the franchise, and attempted to remove some of the most notorious rotten and pocked boroughs. 2. The Factory movement, which campaigned for lower working hours and prohibitions on employing children, or limiting their working hours, and improving conditions for factory workers. 3. The Anti-Poor Law legislation, which attacked the Workhouses set up by the Liberals. 5. Chartism. This was the great working and lower middle class movement demanding the establishment of democracy. All men over the age of 21 were to be given the vote, there were to be equal electoral districts, annual parliaments, and MPs were to be paid, so that politics was no longer the province a wealthy elite. Much of their campaigning consisted in the presentation of giant petitions to parliament. It finally collapsed after the mid-19th century, when most of the signatures in its ‘monster petition’ were found to be forgeries, like ‘Queen Victoria’ and ‘The Duke of Wellington’. Nevertheless, it was a vital episode in the campaign for the expansion of the franchise. 6. The Agitation against the Corn Laws. These had been imposed at the time of the Napoleonic Civil War to keep the price of corn high and so ensure large profits for the farmers by excluding foreign imports. The Liberal politicians Cobden and Bright formed the Anti-Corn Law League to attack them, as they made bread and corn expensive for the working class, and so led to misery and starvation. 7.The Irish Agitation. Most famously led by John Stuart Parnell, this campaigned for Home Rule in opposition to the poverty and oppression experienced by ordinary Irish people under British government. One of the most notorious issues, bitterly resented by the Irish were the absentee landlords, who demanded extremely high rents from their tenants while enjoying life across the Irish Sea. 8. The Public Health Movement. This was another reaction against the disgusting squalor and foetid conditions in the Victorian slums, which led to horrific epidemics of diseases such a cholera. It led to the establishment of local boards of health, subordinate to a central board of health, which were to provide help and advice to the poor on problems with food, clothing, ventilation, drainage and cleanliness. It also resulted in a series of studies and commissions investigating the problems of disease, sanitation and living conditions in towns across Victorian Britain. Much of this was done or inspired by the Benthamite Radical, Owen Chadwick. These movements gradually transformed industrial Britain. Instead of the laissez-faire philosophy towards government that officially informed government policies and ideology, state interference in the economy and society was increasingly accepted as a necessary means to improve conditions in the new, industrial society that was then emerging. This marked the beginning of a new, collectivist approach to politics that gradually became stronger and led to increasing legislation granting increasing political freedoms and improving conditions for the working and lower middle classes. The 19th century is generally considered to be the heyday of laissez-faire individualism. Much of contemporary libertarianism and the Right-wing desire to ‘roll back the frontiers of the state’ appears to come from a nostalgia for the Victorian period. This was a period when America and Europe industrialised, living conditions improved, and the Western powers, including Russia, subdued and colonised the globe. Much less appreciated on the Right is that this was also an age of grinding poverty and industrial and social unrest. Communism, Anarchism and Socialism were radical responses to the problem of poverty and dispossession experienced by the new masses of the urban poor. It is therefore interesting to read the economic historian, Roger E. Backhouse’s comments, that 19th century economists did not have a doctrinaire position supporting laissez-faire. He also notes that although the classical economists of the 19th century followed Adam Smith’s doctrine of free trade, and many were suspicious of the expansion of state power, these were not inflexible positions. Backhouse states that they tended to be pragmatic about individual cases. ‘The result was a pragmatic outlook in which the role for laissez-faire was severely circumscribed’. This runs somewhat counter to the contemporary Tory view, in which unions are automatically bad for acting against the interests of industry and the consumer, and the 19th century was a golden age created by laissez-faire industry. Laissez-faire was indeed the dominant doctrine of the age, but it was increasingly challenged by the very practical concerns about providing for the greater health and prosperity of Britain’s workers and citizens in the new, mass, industrial society. This increasingly required state regulation, and the economists recognised also the value of the unions in defending the bargaining ability of the workers in this environment.